PlayTech have brought the age of vikings back, but in little bit different fashion than you might imagine – in a format of a pretty innovative gambling game. 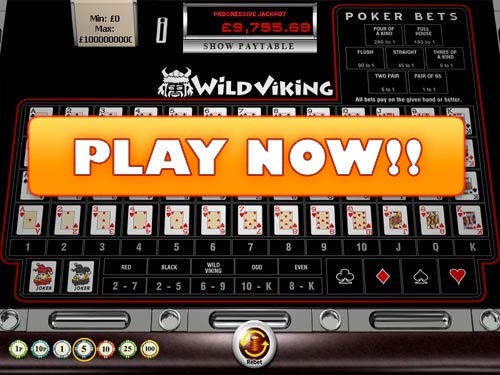 Wild Viking is a game that is a little bit similar to Roulette in terms of gameplay – 5 cards are drawn in every round and players can predict what these cards will be. There actually are different types of wagers you can make or predict, again just like in Roulette, including whether the last card drawn will be odd or even, red or black as well as the exact suit of it. If you’re looking for very simple games, this won’t be it for sure. However, if you want to have a lot of fun while playing a game that is similar to casino roulette, this is exactly what you are looking for! The game is played with a standard deck of 54 cards – 2 jokers are added to the deck. These work similarly as ”wild symbols” in slots – they substitute for any other cards to make a winning combination. Wild Viking game consist of a table layout that seems a little bit complex at first (it really is not) as well as a spot where 5 cards are dealt. When the gameplay starts, you will be required to place a wager predicting either what kind of a poker hand combination will be dealt. However, the main and most important card in this game is th e last one – fifth. Majority of bets are predicting either the value, suit or color of exactly this one, last card. Pair of 6’s or better – 1 to 1 payout odds. Two Pair – 6 to 1 payout odds. Three of a Kind – 9 to 1 payout odds. Straight – 45 to 1 payout odds. Flush – 90 to 1 payout odds. Full House – 150 to 1 payout odds. Four of a Kind – 200 to 1 payout odds. Other wagers are limited to the one last card dealt, you’ll easily spot it as there’s a gap between initial 4 cards and this one. Exact Card – wager on an exact card (including suit) to be dealt. 4 Exact Matches – a wager that also predicts that an exact card will be dealt, but this does not include a specific suit. Joker (Red or Grey) – wager predicting that the last card dealt will be a joker. 2-7/2-5/6-9/10-K/8-K – you can wager on either of these, predicting that the last card will fall in any of the ranges listed. Red/Black – wager on the last card to be either red or black. Odd/Even – wager on the last card to be either odd or even. Wild Wiking – wager on the last card to be either of the two jokers. Exact Suit – you can also predict exact suit of the last card dealt by wagering on the specific field. After putting all the possible wagers in one place, it becomes clear that Wild Viking actually isn’t a game that is all that complicated or hard to play. Wild Viking Royal Flush – Progressive Jackpot. That’s it – you are all set for playing Wild Viking online! The last thing I wanted to add was the best casinos for doing so. This game is developed by PlayTech, so you can play it only at their software powered casinos. Luckily, there are several great brands using it. Winner Casino is the best place for all new players who would want to give this game a try without depositing funds. You’ll get $/£30 in FREE credits just for signing up, these can be used to play this game in real money mode too! CLAIM $30 FREE – CLICK HERE! Bet365 Casino will be great for already experienced players, as their welcome offerings are among the strongest in the industry. You can choose between a regular $100 bonus or a VIP $500 bonus as well as take part in constant promotions that are ran by them. CLICK HERE to Join Bet365 Casino!